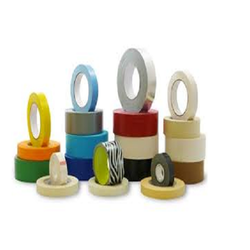 We are a leading Manufacturer of bopp tapes and carton sealing bopp tapes from Mumbai, India. We are the topmost company engaged in providing BOPP Tapes. The range is known for excellent sticking properties and has the mirror finish. Available with cutter and holder, the tapes are offered in various specifications and cater to the needs of varied industries. This tape is manufactured under the strict supervision of our experienced professionals by employing advanced technology in order to meet clients' demands.